Preheat oven to 375 degrees. Peel and cube sweet potatoes. Toss potatoes with chile powder. Spread across baking sheet and bake for 35 min. or until tender when poked with fork. Rinse black beans with water and put in sweet potato bowl. Toss with cumin and cayenne pepper. Chop onion and saute in non-stick pan until translucent. I usually add a little water to help prevent sticking. Once potatoes are done, reduce oven to 350. Cut corn tortillas in halves and quarters to aid with layering. 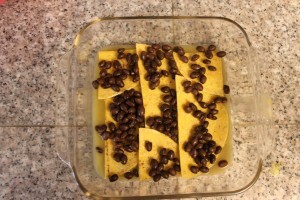 Layer lasagna in 8×8 baking dish as follows: green chile sauce, tortillas, black beans, sweet potatoes, onions. Once all ingredients are used up (mine makes 2 layers) top with nutritional yeast. Cover with foil and bake for 45 minutes at 350. Remove foil with 20 minutes remaining to brown the top. This recipe was very tasty, in fact, absolutely delicious. 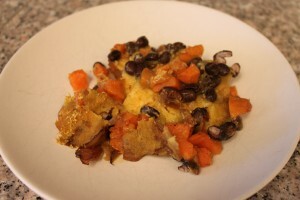 Who would have thought to use sweet potatoes in a Mexican enchilada? I made a few minor tweaks to it. I cut the chili powder in half and used 1 tsp of Mrs. Dash southwestern chipotle seasoning to supplement. I also added a whole clove of fresh garlic minced and used 1/2 black beans and 1/2 red beans because the little red beans are 3 times the amount of fiber over black beans. I also cook my own beans to eliminate the high sodium that comes with canned beans. I am not vegan (yet), so I sprinkled some Aldi fit and active 2% cheddar cheese on top instead of the yeast. I am definitely going to recommend this recipe to others! Thank you to the author of this recipe! You Can water saute’ the onions. Just add a little water to the bottom of a pan and heat. 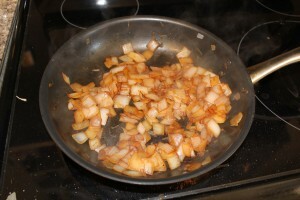 when hot add the onions and saute’ until they are soft and transperent adding a little water if you need to. This is absolutely delicious! Will def make it again and again. I cut the cayenne pepper in half….knowing my tongue couldn’t handle it. Because I haven’t yet found nutritional yeast, I topped it with TVP and sliced tomatoes. Wonderful! Wonderful! This is the kind of dish you could bring to a pot luck! 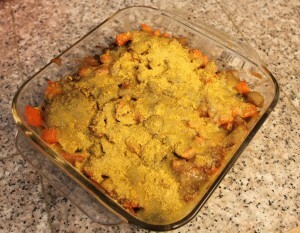 When I made this, the nutritional yeast just sits on top kind of powdery. Is there any way to make this more creamy? Making it again this week. Yummo! I have had this recipe bookmarked for months and finally made it for dinner tonight. It turned out great, very tasty. I didn’t have any enchilada sauce around so I made some from scratch which was a great way to adjust the heat to a level I like. I served it with a dollop of sour cream, cubed avocado and some diced tomatoes. Great recipe and very satisfying. I will be making it again soon. I made this tonight and my husband & I both enjoyed it! I added a can of roasted tomatoes in the center of the layers, used a large onion instead of small, and upped the spices. Can I use a little olive oil to sautee the onions? I don’t use any non-stick or teflon lined pans. I am looking forward to trying this! I made this for dinner tonight and it was really good! I added some salt to the potatoes when I put them in the oven. Also, I couldn’t find any green enchilada sauce at my grocery store so I just used the red. And I didn’t have any nutritional yeast so I just left it out. Still very good. I’ll definitely make it again. So yummy, the best thing I’ve eaten on the diet so far! My husband liked it, and he doesn’t even like sweet potatoes. I used Daiya cheddar cheese instead of nutritional yeast, and I did use the green enchilada sauce. 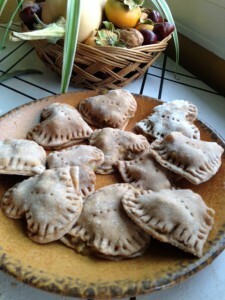 Can I share your recipe on my blog? I will credit you with the recipe and link back to your blog. Thanks! I have just discovered I have moves somewhere where there is no place to buy any enchilada sauce and definitely have no access to tomatillos 🙁 Do you have any substitutes to suggest? I my quest to try and find some enchilada sauce may have seen a green salsa, but I’m not positive. I made this tonight and if I make it again, I will adjust the spices. They were just too overpowering & I usually like a lot of spice. I found a vegan green enchilada sauce made by LaVictoria. Make sure you use 1/2 of the sauce on the bottom of the pan or the tortillas will stick. Can this dish be made a day ahead and cooked the day it is to be served? Made this recipe tonight and used red enchilada sauce instead of green and added some corn in with the black beans. Great flavors. A little more spicy than I like, but those who like southwest style spice will enjoy. Next time I might add a few more corn tortillas. Difficult to “dish out”, but that’s the only negative. Thanks for the recipe! It gives food a cheesy flavor. You could probably just leave it out of this recipe, though it will lose some flavor. What is Nutritional Yeast? Never heard of it…is there anything else that i could subsitute for? Totally excited about trying this tomorrow. Tomatillos are green and add a zesty flavor to any latin dish. Try it pureed for green sauce. Really good! Just served it to my family and they loved it! I did add some corn and used red sauce as well. Highly recommended and inexpensive too! Just made this for lunch with my sister, and it was delicious. The green sauce that we bought was super spicy, but we topped the “lasagna” with avocados and vegan sour cream, which kinda balanced the whole thing out. We will definitely be making this again! During our recent east coast heatwave, I wanted to avoid using the stove or oven, so I adapted this for the microwave. I cooked 2 ears of corn (in the husk) in the microwave, let it cool and cut it off the cob. I put the sweet potato cubes in a bowl with a couple tablespoons of water, covered and nuked until tender. Then I tossed in the chili powder. Same thing with the onions, nuked til soft. Then I layered all the ingredients (used red enchilada sauce and had a little left-over rice that I added in, too) into small rectangle pyrex dishes (used 3), covered and nuked until bubby, and hot in the center. Removed cover and sprinkled on some cheeze instead of the nutritional yeast. What a great dinner without heating up the kitchen when the A/C was working overtime to battle the 100 degree heat! This recipe looks delicious! I would try with dried / soaked black beans if you have time to soak / cook them beforehand. Awesome. I could have eaten the whole pan!! But alas, I had to share…I will TOTALLY be making this again soon!! Curious, I am having a hard time finding it myself, but check your local health food stores. What is the nutritional yeast for? Can it be made without this ingredient? Not a fan of sweet potatoes. Can I substitute for regular potatoes? I made this for dinner tonight and really enjoyed it. I had to make green enchilada sauce from scratch though as it’s not available here and I prefer homemade anyway. Thanks for great recipe. I made a variation of this using the previous evening’s leftovers from a vegetarian feijoada. I had rice, black beans, and sweet potatoes and leeks that had been sauteed together for the feijoada. So I used what I had, mixed some salsa with the rice and made a layer of that, between the layers of beans and sweet potatoes/ leeks. Delicious! It’s now my family’s favorite dish. Fantastic….I left out the cumin as I have a family member who is not a big fan. This recipe won all around applause and is definately a keeper. Just made this tonight for our family of 7, including 4 growing boys. They loved it!! I had toppings like fresh cilantro, tomatoes, diced avocados, and cashew sour cream. Delicious. This is MOST definitely going in my recipe box! Trying this tonite. So far smells delicious! I just made this and it was delicious! Next time I’ll use green sauce like the recipe calls for but all I had was red. It was a little spicy but still good. I’m sure it’s even better with green sauce, so thanks a lot for the recipe, I will definitly be making this again. Every bit as good as it looked! So simple, so yummy. I could not find a green vegan enchilada sauce either any suggestions? I put some guacamaole with a bit of cilantro on the side for color and taste. Yumo! This was awesome! I added some frozen corn and cheddar dayia to my layers. But I had to use red enchilada sauce. I couldnt find a green one that was vegan. And I made it with food for life sprouted corn tortillas in a 9×13 casserole dish. Topped with tofutti sour cream! Excellent dish, the spices are perfect. Maryjean – take a laxative. Some of us like to encourage others for posting a great recipe and also when we make it, adding out little tweaks and the like in the comment. Feel free to ignore any posts that do not meet your self-decided rules. I think it’s fine for people to post comments without having made the recipe as long as they don’t give it a star rating until after they’ve tried it. But I would love to see people follow up when they say they are going to make it and tell us how it turned out. I wish people would not post until they have made and tasted the recipe. I really do not care how great it looks, sounds or smells. Taste is where it’s at! This looks so good. I cannot wait to try it. Thanks for your recipes – so helpful. Sounds great! ..printed and shopping for today! Can’t wait to try it – thank you. 15 oz cans for both the beans and the enchilada sauce. I used Hatch enchilada sauce. 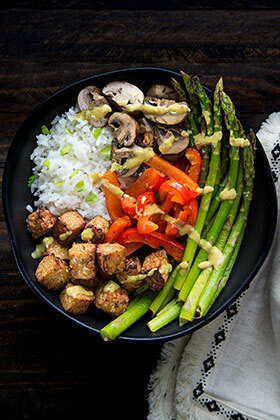 The sauce itself does have some fat in it, but the overall dish has less than 10% of calories from fat. Not bad! I make something very similar to this and it is delicious! Very filling and simple to make ahead of time and bring to work. I make an enchilada sauce that keeps fairly well. If I need something quickly I buy Hatch brand. Thanks for so many terrific recipes! Looks great! What size can of enchilada sauce did you use?